The White Sox are the largest underdog they've been thus far this season for Friday night's opener of a three-game series at the Yankees. 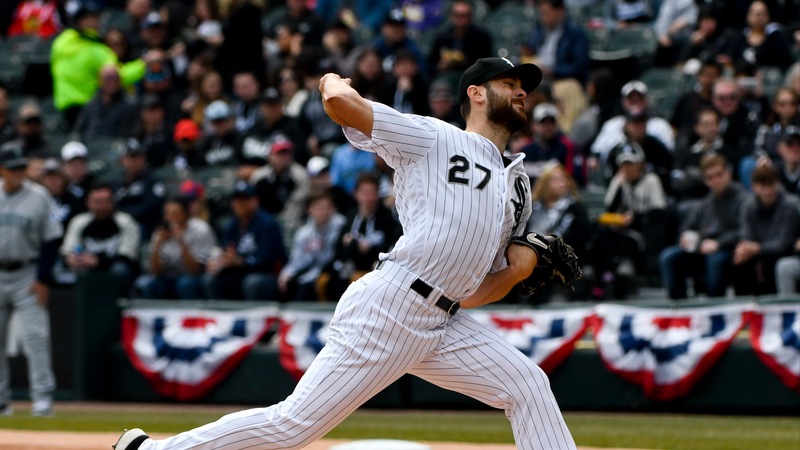 Lucas Giolito starts for Chicago against New York's J.A. Happ, who's also been struggling. The White Sox are massive road underdogs for Friday's opener of [a three-game set against the Yankees](https://www.betchicago.com/mlb-betting/coverage/707b930c-09b8-4650-8622-9e47e3ad1e72/odds) -- and for good reason. Chicago (3-8) is struggling with its pitching (league-worst 6.94 team ERA entering play Thursday), hitting (.694 team OPS, 11th in the American League), fielding (11 errors, fifth-most in baseball) and has lost five straight games. As such, the Sox are +205 underdogs as of Friday morning at the Westgate SuperBook for the 6:05 p.m. CT game in the Bronx (aired locally on WGN) against lefty J.A. Happ (0-1, 6.48 ERA) and the Yanks (5-7; -230). So what *can* Chicago do? Well, in the case of Friday's starter, righty Lucas Giolito (1-1, 5.73), it depends on the night. The 24-year-old was actually very good in his first start, taking a no-hitter into the seventh inning and earning a win after allowing only two runs in 6 2/3 innings with eight strikeouts. But that was against the anemic Royals lineup. He was tagged for five runs on six hits and four walks in 4 1/3 innings of Saturday's [9-2 loss to the Mariners](https://www.betchicago.com/mlb-betting/coverage/559d5f63-e679-4cda-8fc4-dbe7cbda731c/boxscore), the first of five straight team losses. __MORE:__ [Hold off on World Series bets on Rays despite hot start](https://www.betchicago.com/reasons-hold-off-world-series-rays-bets-futures) <a href="https://www.youtube.com/watch?v=b82g_LdQawY" class="embedly-card" data-card-width="100%" data-card-controls="0">Embedded content: https://www.youtube.com/watch?v=b82g_LdQawY</a> Chicago is the largest underdog it has been thus far this season even though New York is also struggling, coming off a three-game sweep in Houston as it starts a nine-game homestand. The Yankees (down 8.6 units on the season) hit four home runs in the series, but the pitching staff allowed 18 runs, including 10 by what's thought to be a vaunted bullpen. Happ (6.94 Fielding Independent Pitching) has faced the Orioles twice, but didn't go more than 4 1/3 innings in either start, allowing 10 hits and three homers. Current White Sox are hitting .301 off him. Nine of 11 Chicago games have gone OVER, and the OVER is on a 6-0-1 run in Happ starts vs. a team with a losing record dating back to last season. Friday's total is nine runs (OVER -115), and we'd advise a play on the OVER. For fantasy advice, monitor the lineups (as always), and if Rick Renteria decides to go with [James McCann](https://www.mlb.com/player/james-mccann-543510) behind the plate for a third start with Giolito, think about streaming him for the day. McCann is 5-for-15 with a double, homer and five RBIs in his career against Happ. ## Friday baseball odds, probable pitchers *Odds from the Westgate SuperBook as of Friday morning. Check [our MLB odds page](https://www.betchicago.com/mlb-betting/odds) for updated betting lines. All times Central. -Tigers at Twins has already been postponed, with a May 11 makeup date. __Angels (+145) at Cubs (-155), 1:20 p.m., MLB Network; Total: 10.5__ LAA: 7-6 CHC: 4-8 Pitching matchup: LAA LHP Tyler Skaggs (1-1, 2.45) vs. CHC LHP Cole Hamels (1-0, 5.73) Betting note: Mike Trout missed Wednesday's win over the Brewers with a strained groin and is considered day-to-day. Los Angeles has won six straight. (**UPDATE**: Trout will miss the game, moving the Angels line to +160, while the Cubs are -170). __Pirates (+162) at Nats (-174), 6:05 p.m., MLB Network (regional); Total: 8 (UNDER -110)__ PIT: 6-5 WSH: 6-5 Pitching matchup: PIT RHP Trevor Williams (1-0, 2.25) vs. WSH LHP Patrick Corbin (0-0, 3.75) Betting note: Pittsburgh and Washington have won five of seven following 1-3 starts. __White Sox (+205) at Yankees (-230), 6:05 p.m.; Total: 9 (OVER -120)__ CWS: 3-8 NYY: 5-7 Pitching matchup: Giolito vs. Happ Betting note: Yankees catcher Gary Sanchez (lower leg tightness) pinch-hit in Wednesday's loss to the Astros and is day-to-day. (**UPDATE**: Sanchez has been placed on the 10-day IL, and the Yankees are now -210, while the White Sox are +190.) __Rays (-126) at Blue Jays (+116), 6:07 p.m.; Total: 8.5 (UNDER -120)__ TB: 10-3 TOR: 4-9 Pitching matchup: TB RHP Ryne Stanek (0-0, 1.50) vs. TOR Trent Thornton (0-0, 1.69) Betting note: Stanek will serve as an opener for Tampa Bay for the third time this season. He pitched a scoreless innings in his first start, striking out the side, and pitched two hitless innings with two strikeouts in his second. __Orioles (+230) at Red Sox (-260), 6:10 p.m.; Total: 10 (UNDER -110)__ BAL: 5-8 BOS: 4-9 Pitching matchup: BAL RHP Dylan Hess (1-1, 2.70) vs. BOS LHP Eduardo Rodriguez (0-2, 12.38) Betting note: The OVER is 10-3 in Baltimore games, including the last seven, and is 9-3-1 in Boston games. __Phillies (-170) at Marlins (+160), 6:10 p.m.; Total: 8 (OVER -130)__ PHI: 7-4 MIA: 3-10 Pitching matchup: PHI RHP Jake Arrieta (1-1, 2.77) vs. MIA RHP Sandy Alcantara (1-0, 1.50) Betting note: Philly catcher J.T. Realmuto, who has a .675 OPS in 11 games, will play his first game as an opponent in Miami after five seasons with the Marlins. __Mets (+103) at Braves (-113), 6:10 p.m., MLB Network (regional); Total: 9 (UNDER -115)__ NYM: 8-4 ATL: 7-5 Pitching matchup: NYM Zack Wheeler (0-1, 10.24) vs. ATL LHP Sean Newcomb (0-0, 1.64) Betting note: Wheeler has allowed 10 hits and eight walks in 9 2/3 innings, and Atlanta had a .366 team OBP entering play Thursday, fourth-best in baseball. __A's (-117) at Rangers (+107), 7:05 p.m.; Total: 10.5 (UNDER -110)__ OAK: 9-8 TEX: 6-6 Pitching matchup: OAK RHP Mike Fiers (2-1, 5.94) vs. TEX LHP Drew Smyly (0-1, 7.11) Betting note: Smyly has allowed five walks and two home runs in 6 1/3 innings, while Fiers gave up six runs on seven hits and four walks in 1 2/3 innings against the Astros in his last start. __Indians (-145) at Royals (+135), 7:15 p.m.; Total: 7.5 (UNDER -115)__ CLE: 8-4 KC: 2-10 Pitching matchup: CLE RHP Carlos Carrasco (1-1, 7.71) vs. KC RHP Brad Keller (1-1, 2.84) Betting note: Kansas City's Whit Merrifield had his 31-game hitting streak -- a team record -- end in Thursday's loss to the Mariners. The Royals have also lost a league-high 10 in a row. __Padres (-120) at D-backs (+110), 8:40 p.m.; Total: 8.5 (OVER -115)__ SD: 9-5 ARI: 6-7 Pitching matchup: SD RHP Chris Paddack (0-0, 1.04) vs. ARI RHP Luke Weaver (0-0, 6.75) Betting note: Paddack has allowed only one earned run in two starts, but he's pitched only 8 2/3 innings due to five walks, leading to high pitch counts. He's also struck out 11. __Brewers (+140) at Dodgers (-150), 9:10 p.m., MLB Network (regional); Total: 8 (OVER -115)__ MIL: 8-5 LAD: 8-6 Pitching matchup: MIL RHP Corbin Burnes (0-1, 9.90) vs. LAD LHP Julio Urias (0-0, 3.12) Betting note: Milwaukee just got swept in three games against the Angels, while Los Angeles just got swept in four games in St. Louis. __Astros (-140) at Mariners (+130), 9:10 p.m., MLB Network (regional); Total: 9 (UNDER -110)__ HOU: 8-5 SEA: 13-2 Pitching matchup: HOU LHP Wade Miley (1-1, 2.31) vs. SEA LHP Wade LeBlanc (2-0, 4.76) Betting note: American League West teams are on a combined 22-game winning streak, including six each for Houston and Seattle. __Rockies (+114) at Giants (-124), 9:15 p.m.; Total: 8 (UNDER -115)__ COL: 3-10 SF: 5-9 Pitching matchup: COL RHP Chad Bettis (0-2, 11.88) vs. SF LHP Drew Pomeranz (0-1, 4.00) Betting note: Colorado has lost six straight and has the worst run differential (-32) in the National League. __PLAY:__ Our [free daily contests](https://betchicago.chalkline.com/games/mlb-daily-pick-5), including [MLB Daily Pick 5](https://betchicago.chalkline.com/games/mlb-daily-pick-5), for the chance to win a BetChicago prize pack.